Your A/C unit can give off a variety of signs to indicate when there is a problem. Being able to identify these signs can mean the difference between repair and replacement. Don’t ignore problems, get them checked out by a professional air conditioning contractor. 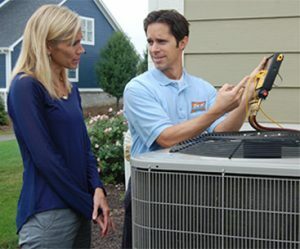 The last thing you want during a hot summer is to have your A/C system breakdown. Below are 6 signs you should not ignore! No cool air. When your A/C System is blowing warm air, it’s a clear sign something is wrong. It may be an indication that something as small as a bad capacitor or blown fuse, which is an easy fix, or a sign of a refrigerant leak, which is a much bigger issue. It may also be a sign of that your system’s compressor has failed or needs service. Lack of airflow. Be sure to check your air filter and change it every month. A dirty air filter can compromise airflow throughout your whole system. This may also be a sign your compressor is failing and that it’s time to consider replacing your A/C system. Thermostat problems. Sometimes the root of the problem is your thermostat, not your A/C system. Thermostat issues may be the problem if you find your home is very cold in one part but stays at the same temperature in another. Moisture (where it shouldn’t be). If you find water pooling near your air conditioner, it may be coming from a drain tube, which could be blocked or broken. This is a simple fix but should be handled quickly to avoid mold problems. A more serious leak is a refrigerant leak. This poses a serious health risk – call a professional and get this fixed right away. Unusual Odors. Pay attention to any unusual smells. A strong, foul smell in your A/C vents normally means the wire insulation of your unit has burned out. Musty smells indicate mold inside your unit or ductwork. Strange sounds. Strange sounds such as squealing or grinding sounds indicate a serious problem, such as a slipped belt, components needing lubrication or a broken motor bearing. Call a professional to check out the problem. Not dealing with this problem can lead to more costly damage to your system later on. Don’t ignore the signs your A/C system is giving you. Many of these problems can be spotted through annual maintenance by a professional technician before they become major, more expensive problems. At Best Heating & Cooling, we’re here to help you out with all of your Utah County and Salt Lake City area A/C problems. Give us a call or schedule service online.